Women's Original Tall Gloss Rain Boots is rated 4.4 out of 5 by 1587. 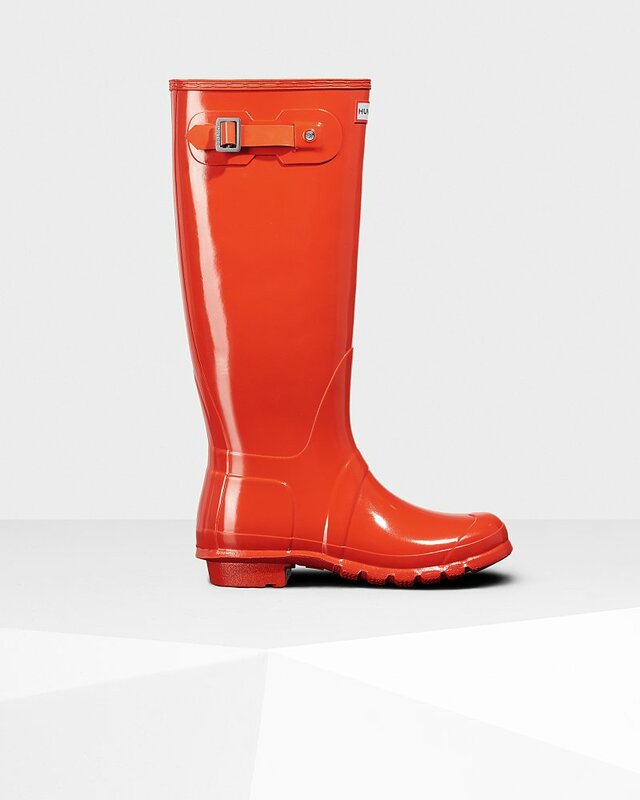 Perfecta para los días de lluvia, esta bota de agua para mujer ha sido la esencia de la marca Hunter Original desde su presentación en 1956. Elaborado con caucho natural, cada par está formado por 28 piezas cortadas a mano y se ensambla durante tres días sobre una horma de aluminio realizada a medida para Hunter, antes de someterse al proceso de vulcanizado para ofrecer mayor protección. Con el dibujo de Hunter Original y un cómodo forro de poliéster, la bota de agua alta y brillante Original es un accesorio esencial y atemporal para los días de lluvia. Rated 5 out of 5 by Beanna531 from Amazing I love my boots. They are comfortable, fashionable all while keeping my feet warm. Rated 5 out of 5 by Roz1234 from Fabulous Boots- Fabulous Company! These boots are a replacement pair from Hunter. They are gorgeous! What a great company— they absolutely stand behind their products! Rated 4 out of 5 by mandi1854 from Awesome color The color is awesomely bright and fun. Comfortable to get on and off - runs a little big. They are on the heavy side though and my legs felt fatigued after wearing them for a few hours. Rated 5 out of 5 by Designer24 from Love your boots! This is the second pair I've bought but, I bought them on my small screen too quickly. I thought they were your red tall boots on sale but they were the bright pink! So sadly, the pink were returned and hoping some day your red ones go on sale!! Rated 5 out of 5 by LisaAnne5 from Waited forever!! I waited forever to purchase my first pair. Why did I wait so long?!?! I love these boots! Completely waterproof, unless you wade into a lake! Look great with everything. I will be purchasing another pair in a different color as there are so many options! Rated 3 out of 5 by Angie from Super cute and classic, but... ...if you have any sort of shape to your legs, they may not fit! I have an athletic calf like all the other women in my family. I usually don’t have trouble when buying knee-high boots, but in those scenarios I am usually trying them on in store. I received my highly anticipated Hunter boots that I wanted for so long, and they unfortunately were just too snug on my calves. I tried to make it work, but I wouldn’t even be able to wear any sort of leggings or sock with them, let alone without anything on my lower legs. Maybe I’ll get a shorter boot someday. Luckily Hunter’s return policy is great and I was refunded my money within days of return. Rated 5 out of 5 by Anonymous from I wear these all the time! Every happy that I went ahead and purchased these!! They fit amazingly and I literally wear them if it raining or not! I get a compliment every time I wear them!